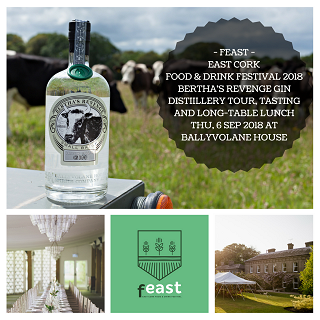 As part of FEAST EAST CORK FOOD & DRINK FESTIVAL, we are delighted to be hosting a Bertha’s Revenge Gin Distillery Tour, Tasting and a long-table lunch at Ballyvolane House on Thursday, 6th September 2018. Time:​ 12noon distillery tour. 1pm lunch. 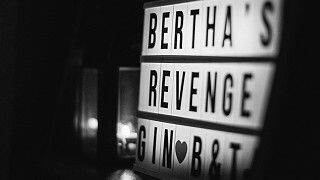 Details of Event:​ Meeting the Makers of Bertha’s Revenge Gin Distillery Tour followed by a long-table lunch​ in the dining terrace. As part of FEAST, EAST CORK FOOD AND DRINK FESTIVAL, we are hosting a ‘Meet the Makers’ Bertha’s Revenge Gin Distillery Tour, Chat and Lunch with Antony Jackson & Justin Green the distillers of Bertha’s Revenge Gin at Ballyvolane House on Thursday, 6th September 2018. The event will kick-off at 12noon with a B&T (Bertha & Tonic) and as soon as everyone has arrived, guests will be given a tour of the house, gardens and gin distillery. Lunch will be prepared by Ballyvolane House Chef Steve Mercer using ingredients from our walled-garden and farm will be served at 1pm in the dining terrace in the barn. We would urge you to book early to avoid disappointment. It promises to be a fun and sociable event where guests can ‘Meet the Makers’ enjoy a good lunch and sample some delicious Bertha tipples in a lovely setting. We hope you can join us! Booking/Ticket Info:​ Email: info@ballyvolanehouse.ie | Phone: 025 36349 | Book tickets online: ballyvolanehouse.ie​. We hope you can join us for what promises to be a fun and fascinating afternoon. We are delighted to bring you The Rambling Siulers, who will be performing at the next ‘BERTHA SESSIONS’ live-music and curry supper in the barn at Ballyvolane House on Friday, 5th April 2019. Eoin & Mo are extremely talented Irish Musicians and we are delighted to have them back to play their second Bertha Sessions. 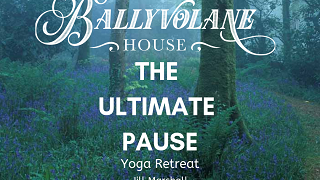 The Ultimate Pause Yoga Retreat with Jill Marshall. 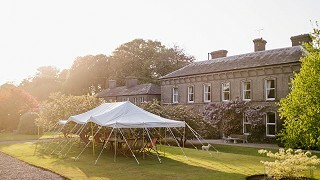 Treat yourself to a relaxing weekend with Jill Marshall at Ballyvolane House from 9th to 12th May 2019. Set amongst tranquil verdant gardens, woods and parkland, and surrounded by the sounds of nature, Ballyvolane House makes the perfect backdrop to this 3 day Yoga retreat. Enjoy energising yoga, relaxing meditation, communing with nature and delicious food. Connect the mind and body, release the tensions from within the emotional and physical realms, and enhance ultimate happiness and good health. Leave Ballyvolane House feeling nourished, refreshed and re-energised. Jill Marshall hails from Hong Kong, and brings with her a wealth of experience as a mind-body practitioner. She has become a successful, sought-after postural specialist using Pilates, Yoga, Nia and Meditation. Jill has won an award for her contribution to health and wellness in Hong Kong and has set up a company called ‘Pause’, which is dedicated to assessing alternative health. Escape to Ballyvolane House this spring. Stay in a glorious historic Irish country house, feast on delicious home-grown food meticulously prepared by House Chef Steve Mercer, sip on our own Bertha’s Revenge Gin tipples, explore the delights of the locality such as cliff walks on the coast, hike up the Knockmealdown or Galtee mountains, graze at farmers’ markets, visit Cork City and Kinsale, cast a fly on the river Blackwater or gently glide down the river in a canoe or simply relax. Enjoy late breakfasts, curl up by the fire and immerse yourself in all the latest glossy magazines, stroll around the gardens and if you love animals, bring your dog or come and help feed the pigs, donkeys and poultry. We are always happy to help plan day trips during the day and book a table at some of our excellent local eateries. We also have a cracking offer for families during the Easter hols. We have compiled a selection of value special offers which you won’t find online and are only available to guests if booked directly with us. To book or for more information, please email us on info@ballyvolanehouse.ie or phone us on 025 37349.